A 57-year-old euthyroid male presented for hoarseness of voice of three months duration. There was no history of associated stridor, respiratory distress, and hemoptysis. He denied loss of appetite, loss of weight, past ionizing radiation, or family history of thyroid malignancy. Examination revealed a swelling of approximately 5 cm × 5 cm in dimension, predominantly involving the right anterior half of the neck. Palpation confirmed a single, firm, nontender swelling moving with deglutition. There was no palpable lymphadenopathy or hepatosplenomegaly. The clinical possibilities of benign (e.g., goiter) as well as malignant disorders (e.g., thyroid or parathyroid carcinoma and lymphoma) were kept. Ultrasonography revealed an ill-defined solid hypoechoic mass (4.3 cm × 3.0 cm × 2.3 cm) arising from the superolateral margin of the thyroid gland and extending laterally outside the thyroid capsule. Thyroid profile and parathyroid hormone levels were within normal limits. Hemogram, erythrocyte sedimentation rate, and renal and liver function tests were also normal. 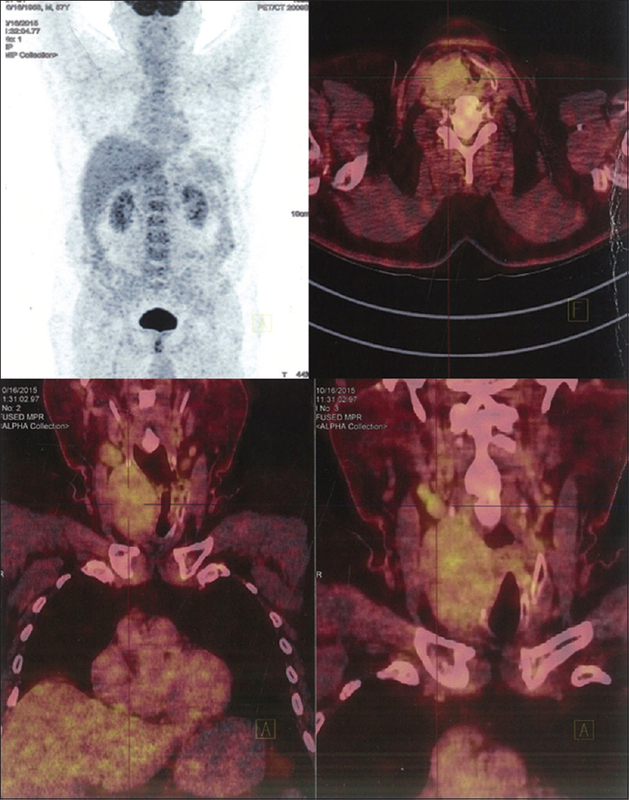 Positron emission tomography/computed tomography (PET/CT) scan confirmed a thyroid mass with moderate fluorodeoxyglucose uptake, with SUVmax of 3.5 [Figure 1]. Fine-needle aspiration cytology (FNAC) with cell block from the thyroid mass showed infiltration by plasma cells [Figure 2]a, [Figure 2]b, [Figure 2]c. Flowcytometric analysis (FCA) of the aspirate showed bright positivity for CD38 and dim for CD138 with cyto-kappa restriction. Immunochemistry done on cell block was strongly positive for CD38 and CD138 [Figure 2]d. Serum protein electrophoresis (SPEP) showed monoclonal gammopathy (M spike of 0.56) seen in the gamma globulin region. Bone marrow biopsy and serum beta-2 microglobulin were done and a final diagnosis of multiple myeloma (MM, IgG lambda, ISS-II) with thyroid plasmacytoma was confirmed. He was started on weekly cyclophosphamide (300 mg/m 2), oral dexamethasone (40 mg), and injection bortezomib (1.4 mg/m 2 subcutaneous) regimen. After two courses, a repeat evaluation showed 50% reduction in M band levels (from 0.56 to 0.26 g/dl) and neck swelling (both clinically and radiologically). He is planned for autologous hematopoietic stem cell transplantation after achieving disease remission. The incidence of EM disease in MM patients has significantly increased in recent years owing to more sensitive imaging techniques and prolonged survival of MM patients., Extraosseous involvement usually occurs late during the disease course, confers a poor prognosis, and is associated with shorter progression-free and overall survival., We have also recently reported EMPs in duodenum, pancreas, and ovary in a single patient. Similar to our case, Vailati et al. have also reported plasmacytoma of the thyroid as an initial presentation of MM. Serefhanoglu et al. reported an unusual initial presentation of MM involving thyroid gland and pericardium with myelomatous pleural and pericardial effusion. EMP of the thyroid usually presents as a painless, firm, nontender, mobile, multinodular, or diffuse thyroid mass with no associated cervical lymphadenopathy and patients can be either euthyroid or hypothyroid. In the present case, the patient was euthyroid and presented with hoarseness of voice. Tandon et al. reported a case of plasma cell leukemia in which thyroid involvement was initially masked by Hashimoto's thyroiditis. The gold standard diagnostic test for thyroid solitary plasmacytoma is histological confirmation. There are very few reports on the diagnosis of these cases by cytology. The cytology smears in the present case had predominant population of plasma cells, most of which were mature along with many binucleate and immature forms [Figure 2]b. These findings are similar to those described by others in the past. One of the most challenging issues in the diagnosis of solitary thyroid plasmacytoma is to rule out systemic involvement by MM. Normal bone marrow findings, absence of lytic bone lesions, and no or minimal M spike are confirmatory findings seen in solitary thyroid plasmacytoma. Rubin et al. reported that 33% of the patients of solitary plasmacytoma of the thyroid can present with monoclonal gammopathy. In the present case, SPEP revealed monoclonal gammopathy, with bone marrow showing ~10% plasma cells, and there were lytic lesions in the frontal bone. Hence, a diagnosis of MM with thyroid plasmacytoma was made. PET/CT in MM also helps to know the disease burden and to know the hidden, asymptomatic EM sites where local radiation therapy could also be beneficial. Based on the preoperative FNAC findings, a specific diagnosis of thyroid plasmacytomas can be difficult because of its rarity. Moreover, diagnosis can be confusing in many cases because thyroid plasmacytoma may resemble other, more common thyroid lesions, including both benign and malignant neoplasms. Careful cytomorphologic examination and supportive studies are required to ensure the right diagnosis in a suspected case. In the index case, FCA, immunocytochemistry (IHC), and PET/CT validated the diagnosis of MM with thyroid plasmacytoma. Kashyap R, Reddy R, Prasanna V. Rare involvement of thyroid cartilage and thyroid gland by multiple myeloma on 18F-fluorodeoxyglucose positron emission tomography/computed tomography. Indian J Nucl Med 2018;33:227-9. Gautam A, Sahu KK, Alamgir A, Siddiqi I, Ailawadhi S. Extramedullary solitary plasmacytoma: Demonstrating the role of 18F-FDG PET imaging. J Clin Diagn Res 2017;11:XD01-3. Sahu KK, Kumar PD, Yanamandra U, Malhotra P. Macrofocal multiple myeloma with frontal plasmacytoma. BMJ Case Rep 2015;2015. pii: bcr2015210759. Varettoni M, Corso A, Pica G, Mangiacavalli S, Pascutto C, Lazzarino M, et al. Incidence, presenting features and outcome of extramedullary disease in multiple myeloma: A longitudinal study on 1003 consecutive patients. Ann Oncol 2010;21:325-30. Vailati A, Marena C, Milani F, Aristia L, Sozzé E, Galenda P, et al. Cytological evidence of plasmacytoma of the thyroid. Haematologica 1995;80:91-2. Serefhanoglu S, Sayinalp N, Haznedaroglu IC, Goker H, Cetiner D, Aksu S, et al. Extramedullary plasmacytomas of the thyroid and pericardium as initial presentation of multiple myeloma. Ann Hematol 2008;87:853-4. Aozasa K, Inoue A, Yoshimura H, Miyauchi A, Matsuzuka F, Kuma K, et al. Plasmacytoma of the thyroid gland. Cancer 1986;58:105-10. Tandon A, Paul TR, Singh R, Narendra AM. Synchronous thyroid involvement in plasma cell leukemia masquerading as Hashimoto's thyroiditis: Role of ancillary cytology techniques in diagnostic workup. Endocr Pathol 2015;26:324-7. Lee CH, Jung YY, Chung YR, Ryu HS. 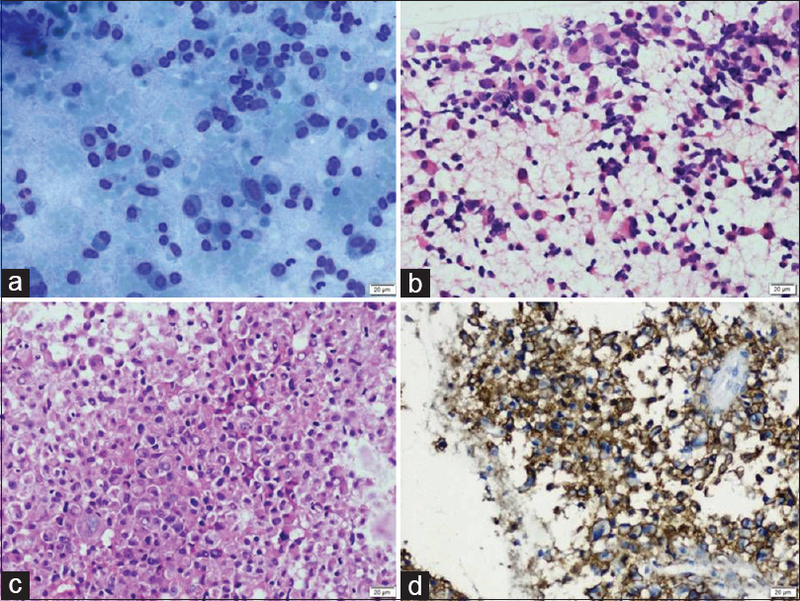 Liquid-based cytologic findings of solitary extramedullary plasmacytoma in thyroid: A case report identified with fine-needle aspiration cytology. Diagn Cytopathol 2014;42:964-9. Rubin J, Johnson JT, Killeen R, Barnes L. Extramedullary plasmacytoma of the thyroid associated with a serum monoclonal gammopathy. Arch Otolaryngol Head Neck Surg 1990;116:855-9. Sahu KK, Mishra K, Dhibar DP, Ram T, Kumar G, Jain S, et al. Priapism as the presenting manifestation of multiple myeloma. Indian J Hematol Blood Transfus 2017;33:133-6. Sahu KK, Gautam A, Ailawadhi S. Re: FDG PET/CT findings of intracardiac myeloid sarcoma. Clin Nucl Med 2017;42:242-5.